Salmon is one of the 'big three' when it comes to fish. Right up there with tuna and cod in terms of popularity, salmon is a great choice. This juicy, tasty fish is easy to find and also simple to prepare. 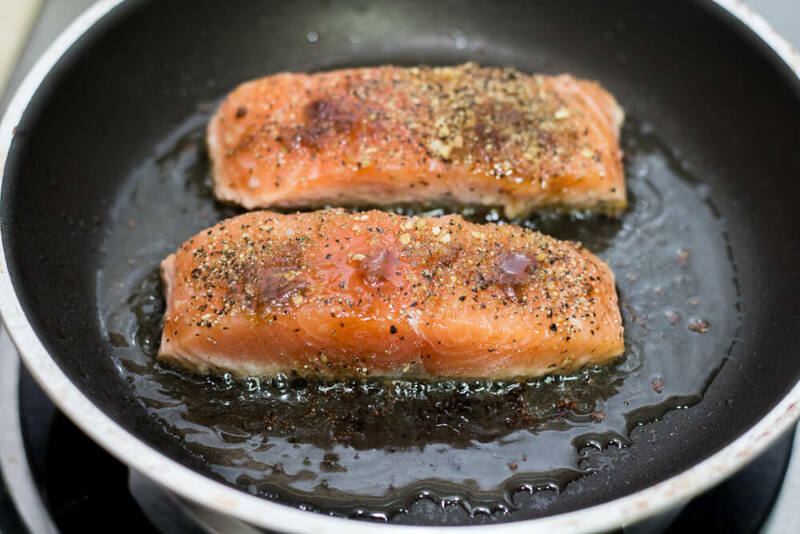 In this easy pan cooked salmon recipe, we are adding a little paprika for flavour, and cooking the fish in a pan. Choose a big, heavy-bottomed pan for the best results. The saying is: 'when fish flakes, it is cooked' and you can either go by that, or cook it slightly under. As soon as it is no longer glossy in the centre, your salmon is done. 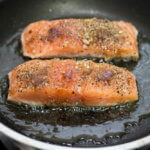 The best way to cook salmon in a pan is to cook it until it's half done, not moving it during this time, then flip it over and cook the other side. You don't need to move it around in the pan. Just let it cook. It will come away from the pan, and not stick to it, when it's ready. How about mashed potatoes or pasta? Green beans, broccoli or sugar snap peas would also be good choices for side dishes. If you prefer a simple green salad, that would also be a winning side dish idea. 1. Grind salt and pepper over the fish, then dust with paprika. 2. Coat the bottom of a heavy pan with oil, then add the butter. 3. Heat the pan over a medium-high heat and then add the fish skin side down. 4. Cook until you can see the sides halfway up the fillets are done. 5. They will turn from glossy dark pink to opaque light pink. 6. Don't move the salmon during this time. 7. Now flip the fish and cook until the other side is done.